Kageyama, H., Waditee-Sirisattha, R., Sirisattha, S., Tanaka, Y., Mahakhant, A. and Takabe, T. (2015). Extraction and Quantification of Alkanes in Cyanobacteria. Bio-protocol 5(24): e1684. DOI: 10.21769/BioProtoc.1684. Many species of cyanobacteria accumulate alkanes in their cells. It has been reported that these cyanobacteria accumulate mainly 15 long carbon chain alkane, pentadecane (C15H32), or/and 17 long chain alkane, heptadecane (C17H36). Here we describe a protocol of our laboratory for extraction and quantification of cyanobacterial intracellular pentadecane and heptadecane. We have confirmed this protocol was applicable to at least three kinds of cyanobacteria, nitrogen-fixing filamentous cyanobacterium Anabaena sp. PCC7120, non-diazotrophic unicellular cyanobacterium Synechococcus elongatus PCC7942 and halotolerant unicellular cyanobacterium Aphanothece halophytica. Note: Currently, it is “Sigma-Aldrich, catalog number: 28-3440 ”. Note: Currently, it is “Sigma-Aldrich, catalog number: 24-5240 ”. Note: Currently, it is “Sigma-Aldrich, catalog number: 05-0590 ”. Note: Currently, it is “Sigma-Aldrich, catalog number: 05-4930 ”. Note: Currently, it is “Sigma-Aldrich, catalog number: 03-2900 ”. Note: Currently, it is “Sigma-Aldrich, catalog number: 37-0550 ”. Note: Currently, it is “Sigma-Aldrich, catalog number: 28-3400 ”. Note: Currently, it is “Sigma-Aldrich, catalog number: 05-6220 ”. Note: Currently, it is “Sigma-Aldrich, catalog number: 05-5230 ”. Anabaena sp. PCC7120 and Synechococcus elongatus PCC7942 were grown in liquid BG-11 media in glass conical flasks at 30 °C under constant white fluorescent light at approximately 40 μE/m2/s in thermostatic chamber. The cultures were shaken at 105 rpm. In the case of Aphanothece halophytica, BG-11 medium plus Turk Island salt solution (0.5 M NaCl) was used instead of BG-11 medium. The growth of cyanobacterial cells was monitored by measuring the absorbance at 730 nm with a spectrophotometer. Other conditions such as abiotic stress condition (nitrogen starvation, high salinity, etc.) were applicable (Kageyama et al., 2015). Culture volume should be less than 200 ml in 500 ml size flask. Cyanobacterial cells grown exponentially were precipitated by centrifugation at 4,300 x g for 15 min at 4 °C from 50 ml cultures (OD730=~0.6). After discarding media by decantation, the cells were suspended in the remaining media (~1 ml). Cell suspensions were transferred to preweighed 1.5 ml sampling tubes. Cells were precipitated by centrifugation at 22,000 x g for 10 min at 4 °C, then media were removed completely. Cells were stored at -80 °C before use. Frozen cells were dried up using a vacuum evaporator. Dry cell weight was measured. Note: Usually ~20 mg of dried cells was obtained. Methanol was added to dried cells. Note: We added 1 ml of Methanol/20 mg of dried cells. 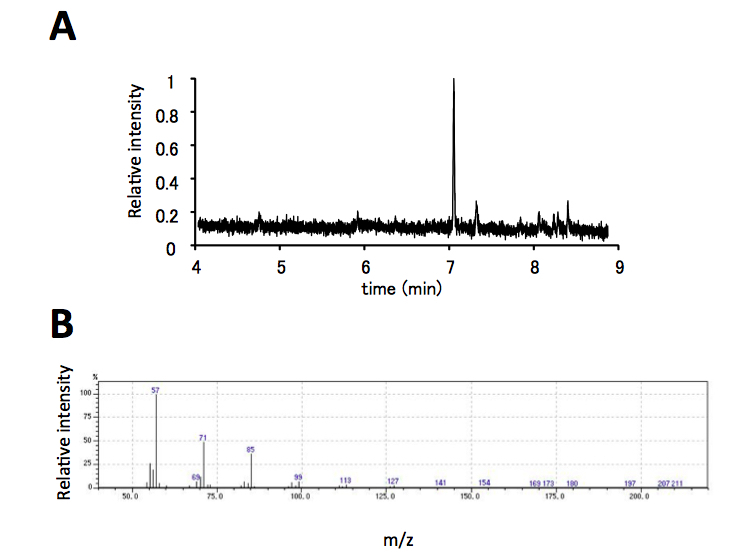 Cells were disrupted by sonication (output: 7, total on time: 6 min). Samples were on ice during sonication treatment with 12 burst of 30 sec followed by intervals of 30 sec for cooling. Be careful that the methanol extract does not scatter during sonication treatment. Samples were incubated at 4 °C for overnight. Cell debris was precipitated by centrifugation at 22,000 x g for 10 min at 25 °C, then the supernatants were transferred into new 1.5 ml tubes. This methanol extract contained alkanes. Note: After preparing the extracts, we subjected extracts to GC-MS analysis immediately. 500 μl of methanol extracts contain alkanes were transferred into glass vials designed for GC-MS. Helium was used as the carrier gas at the flow rate of 1.3 ml min-1. 8 μl of samples were injected using a 1:100 split* ratio of helium carrier gas to column at 300 °C of inlet temperature. Initial oven temperature of 100 °C for 3 min. Ramp to 320 °C at a rate of 20 °C/min. *Note: Glass insert designed for split analysis should be used. For Quantification of pentadecane and heptadecane, we used authentic standards. These authentic standards of alkane were diluted with methanol, and then subjected to GC-MS to make standard curves. Standard curves were made by using the peak area calculated by GCMSsolution software. Retention time of pentadecane and heptadecane using the method described above was ~5.6 and ~7.0 min, respectively (Figure 1A). 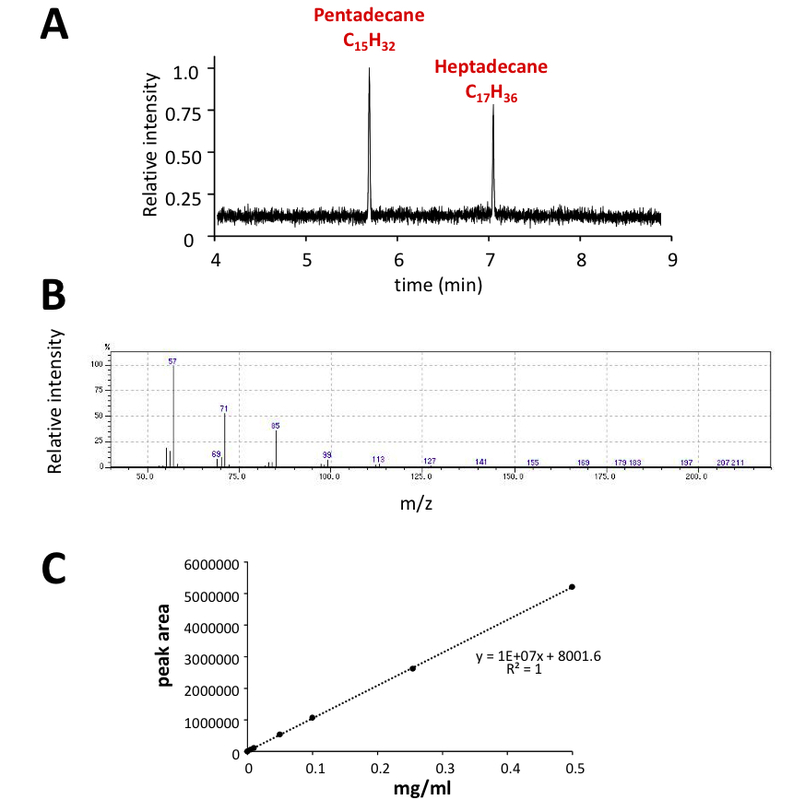 For identification of pentadecane and heptadecane in cyanobacterial extracts, their retention times of the peaks in chromatogram and fragmentation patterns of product peaks were compared with authentic standards (Figure 1 and Figure 2). As a representative data, chromatogram using Anabaena sp. PCC7120 extract and fragmentation pattern of the peak at 7 min were shown (Figure 2). For quantification of pentadecane and heptadecane in cyanobacteria, area of the target peak obtained by GC-MS was calculated by GCMSsolution software, and then concentration was determined using standard curve of authentic standards. As shown in Figure 1C, standard curve of heptadecane was linear at the range of 0.005 - 0.5 mg/ml. A similar line was also obtained for pentadecane. Figure 1. GC-MS profile and standard curve of authentic standards. Chromatogram of pentadecane and heptadecane (A), and fragmentation pattern (B) and standard curve (C) of heptadecane are shown. Figure 2. GC-MS profile of methanol extract of Anabaena sp. PCC7120. A. Chromatogram indicated the main peak appeared at 7.0 min. B. Fragmentation pattern of the main peak at 7 min was similar to that of heptadecane authentic standard (see Figure 1B). For preparation of BG-11 medium, firstly 1.5 g of NaNO3 was dissolved in H2O (~700 ml). Then the stock solutions above were added 1 ml each. Final volume was adjusted to 1 L with H2O. This medium was distributed into flasks and autoclaved for culturing cyanobacteria, Anabaena sp. PCC7120 and Synechococcus elongatus PCC7942. For preparation of BG-11 medium plus Turk Island salt solution (0.5 M NaCl), 28.17 g of NaCl, 0.67 g of KCl, 6.92 g of MgSO4.7H2O, 5.50 g of MgCl2.6H2O and 1.47 g of CaCl2.2H2O were added before adjusted to 1 L with H2O. It is noted that Aphanothece halophytica can grow in a wide range of salinity from 0.25 to 3.0 M NaCl. This work was supported in part by Grants-in-Aid for Scientific Research from the Ministry of Education, Science and Culture of Japan and the International Research Center for Natural Environmental Science of Meijo University. Hibino, T., Kaku, N., Yoshizawa, T., Takabe, T. and Takabe, T. (1999). Molecular characterization of DnaK from the halotolerant cyanobacterium Aphanothece halophytica for ATPase, protein folding, copperbinding under various salinity conditions. Plant Mol Biol 40(3): 409-418. Kageyama, H., Waditee-Sirisattha, R., Sirisattha, S., Tanaka, Y., Mahakhant, A. and Takabe, T. (2015). Improved alkane production in nitrogen-fixing and halotolerant Cyanobacteria via abiotic stresses and genetic manipulation of alkane synthetic genes. Curr Microbiol 71(1): 115-120. Stanier, R. Y., Kunisawa, R., Mandel, M. and Cohen-Bazire, G. (1971). Purification and properties of unicellular blue-green algae (order Chroococcales). Bacterial Rev 35(2): 171-205. How to cite: Kageyama, H., Waditee-Sirisattha, R., Sirisattha, S., Tanaka, Y., Mahakhant, A. and Takabe, T. (2015). 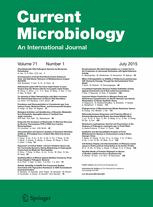 Extraction and Quantification of Alkanes in Cyanobacteria. Bio-protocol 5(24): e1684. DOI: 10.21769/BioProtoc.1684.